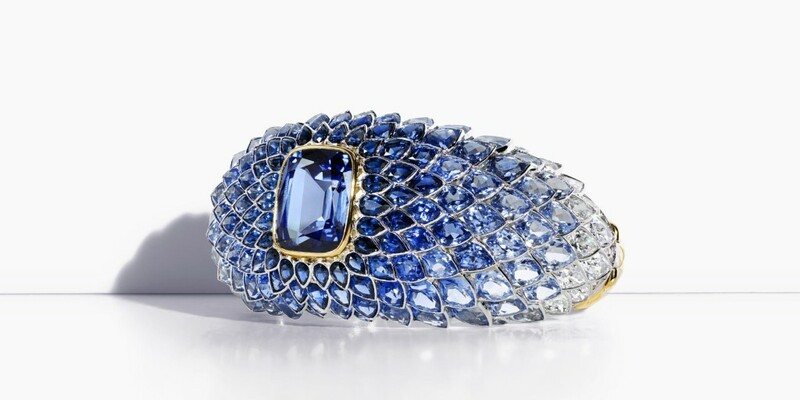 Scales Blue Spinel, Sapphire and Diamond Bracelet in 18k gold by Tiffany and Co. When rays of light penetrate the sea, graduating hues are revealed. 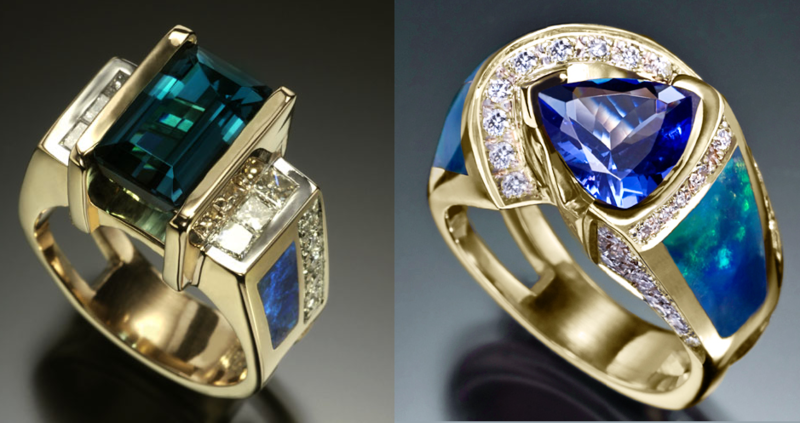 evoke the colors of water at various depths. fins so they can flow gracefully through the water. 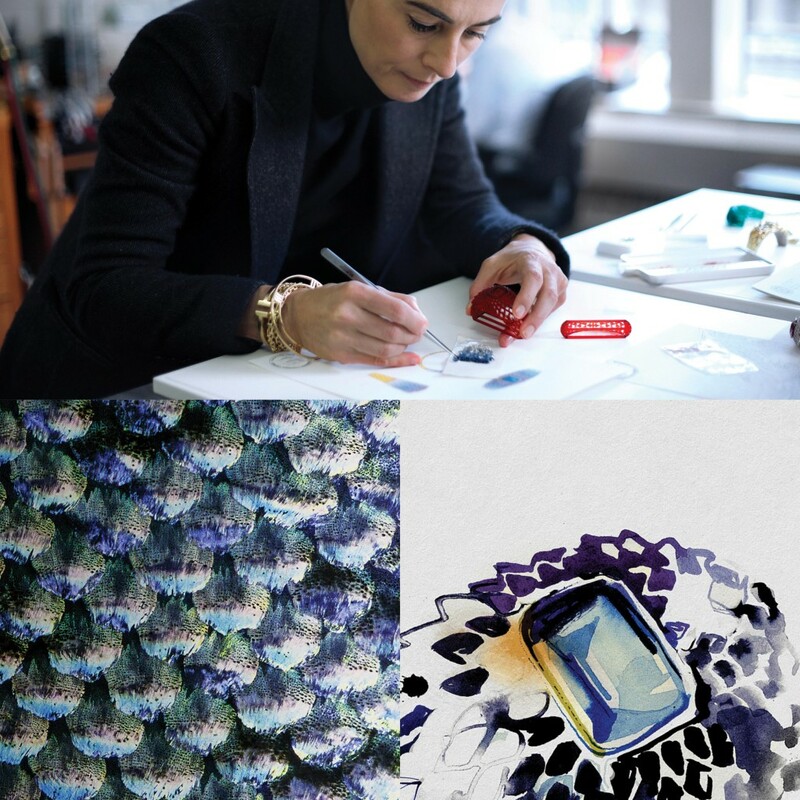 Since its founding, Tiffany has been at the forefront of the world’s greatest design movements. Its Japanesque silver won Tiffany the highest honors at the 1878 Paris World Exposition and at the turn of the twentieth century, Louis Comfort Tiffany emerged as an Art Nouveau leader. 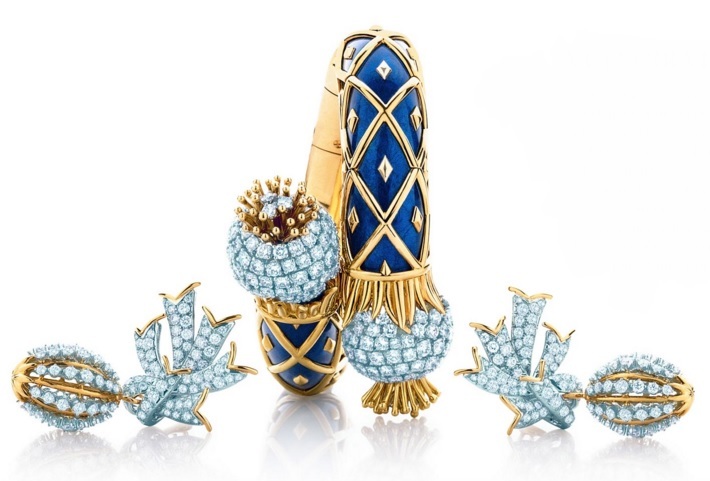 From glamorous, geometric Art Deco pieces and bold cocktail-style creations to the nature-inspired works of Jean Schlumberger and Elsa Peretti, Tiffany has broken new ground time and again with exceptional designs that remain relevant today. 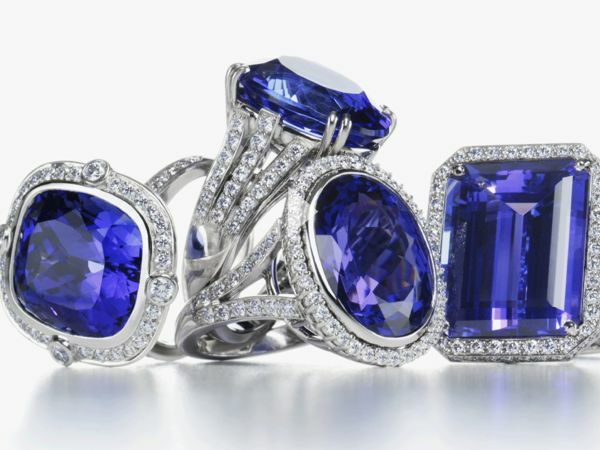 Over the years, Tiffany & Co. has introduced the world to diamonds of breathtaking brilliance and a marvelous selection of previously unknown colored gemstones. 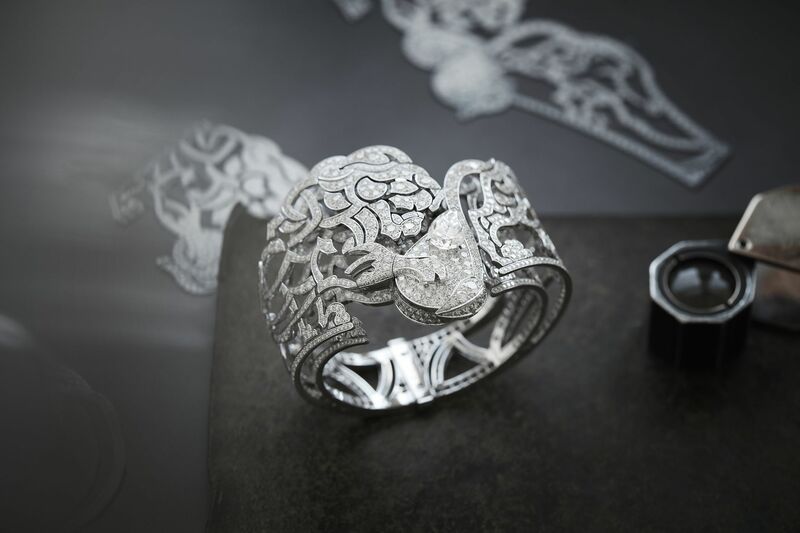 Since the early twentieth century, the world has been enchanted with Tiffany glamour. In the 1961 Hollywood classic Breakfast at Tiffany’s, Audrey Hepburn® personified Tiffany style. First ladies, tastemakers and renowned photographers have also turned to Tiffany jewelry as the ultimate fashion accessory. 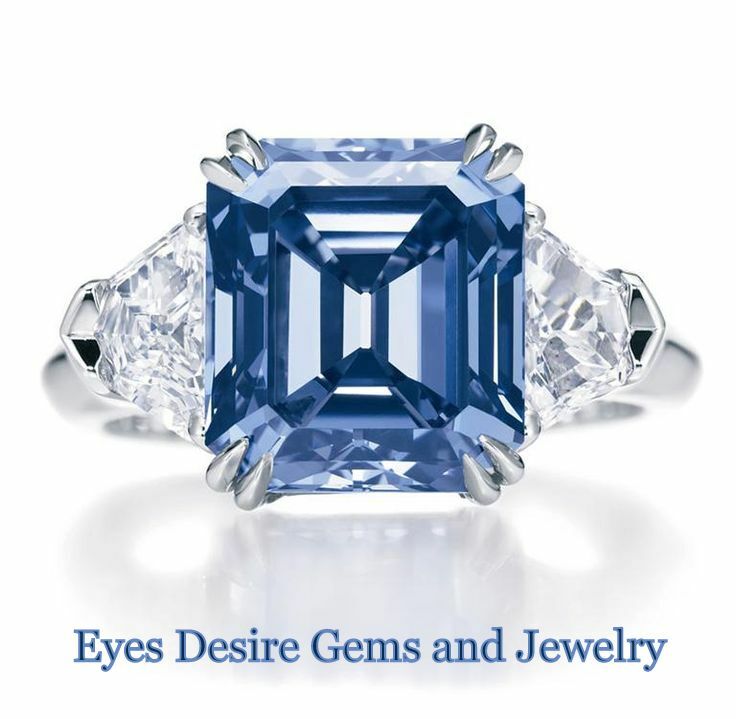 Today, Tiffany’s exquisite designs continue to exude sophistication and elegance in magazines, in films and on the red carpet, adorning luminaries of popular culture like Kate Winslet, Angelina Jolie, Anne Hathaway and countless others. 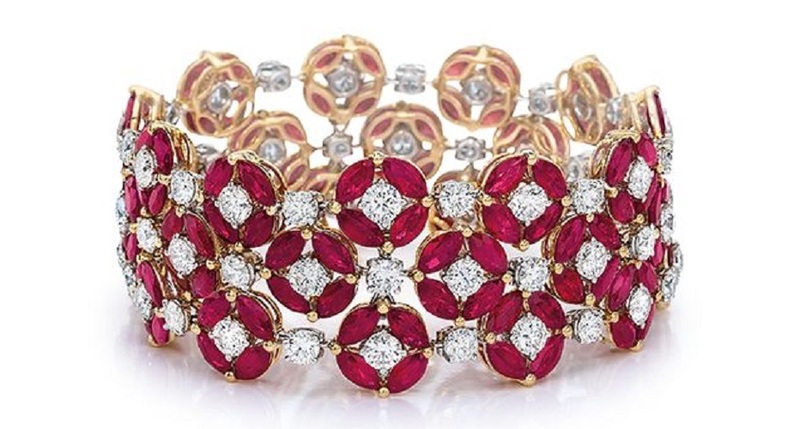 Bracelet, Diamond, Sapphire, Spinel, Tiffany and Co.
Luxurious ruby and diamond bracelet by Paco Art Hong Kong. 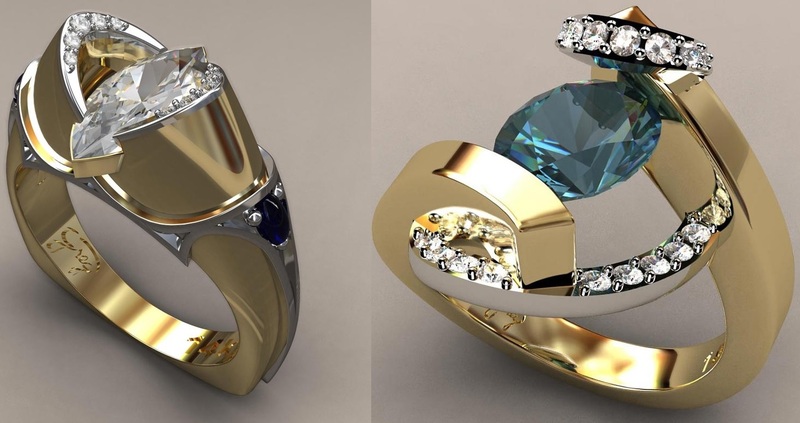 A well-known industry leader specializing in manufacturing and wholesale of the most finest and exceptional white and colored diamonds, offering to its customer’s one-of-a-kind jewelry creations. 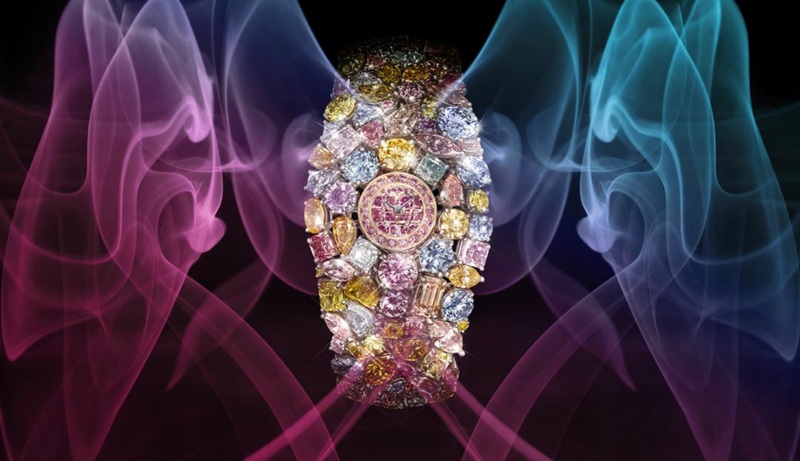 The symbol of the lion has been an important one in the history of CHANEL, ever since Gabrielle Chanel –born under the sign of Leo – embraced the symbolism, drew inspiration from and identified with the qualities of the powerful animal. 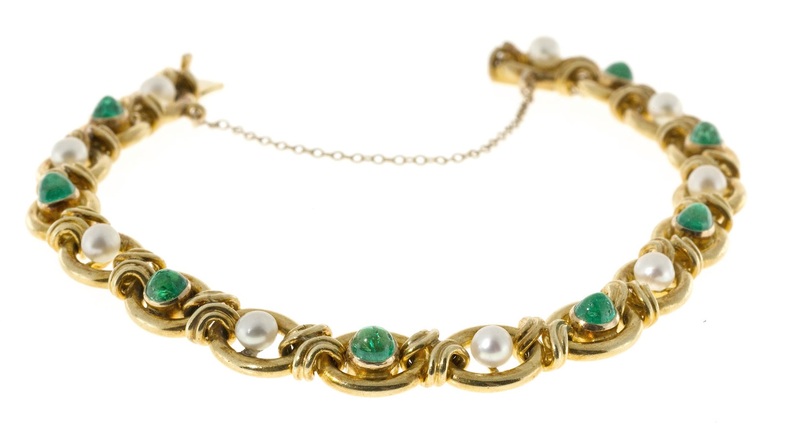 Hand made natural patina 14k Victorian 1910 bracelet with certified natural pearls and certified genuine natural color gem high dome cabochon Emeralds with faint clarity enhancement only. Amazing condition for it’s age. 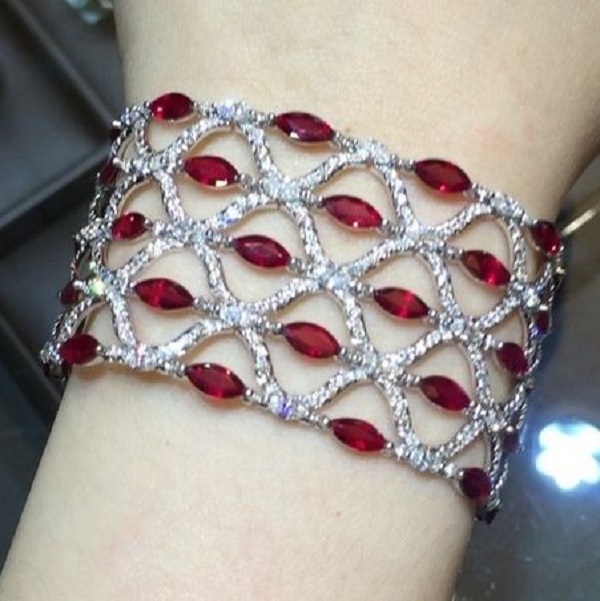 All original beautiful old bracelet. Excellent condition, no repairs or defects. Looks great on the wrist. 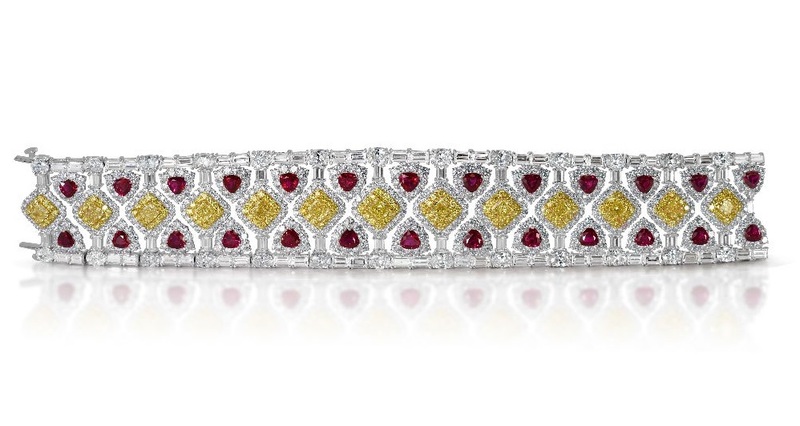 Setare designed this eye-catching bracelet to thrill and delight its wearer. 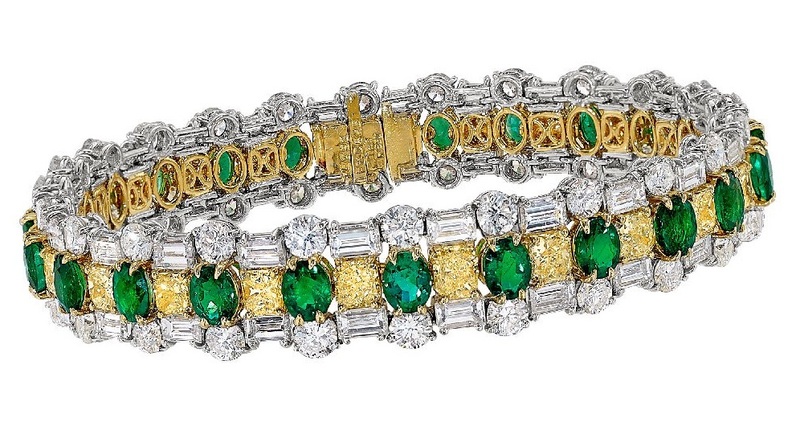 The bracelet features 8 carats of Zambian oval emeralds, paired with 6 carats of intense radiant yellow diamonds. 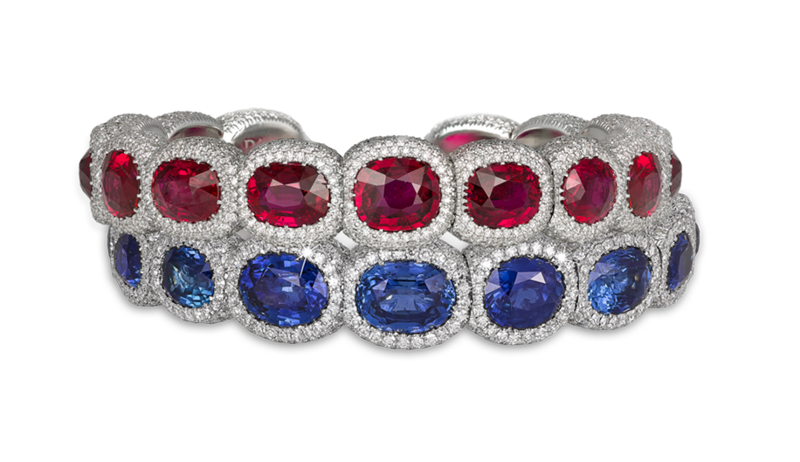 The colors of the gemstones unite beautifully, creating a natural rhythm and splendor. 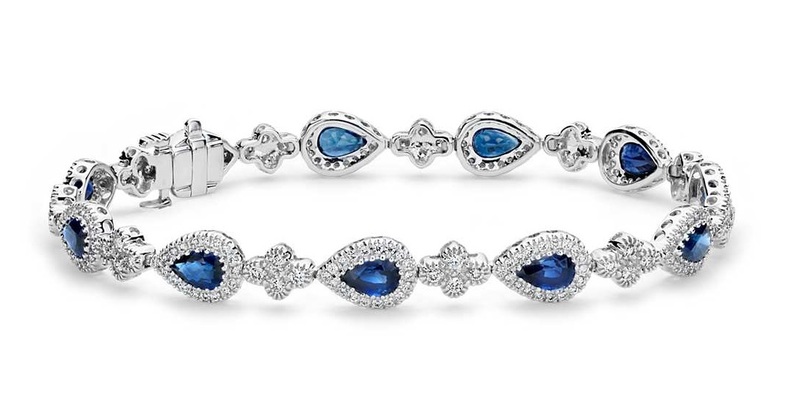 And when paired with its matching necklace, this exquisite bracelet becomes part of an intricate ensemble, designed to inspire envy and desire in all its admirers. A phenomenal bracelet incorporating the very finest emerald cut emeralds and a series of scintillating diamonds.